But let’s face it, it is difficult to sift through the hundreds of apps out there to find the real gems. As a parent, avid traveler, lover of maps and app developer, I’ve put together this primer on some of the amazing things map apps can do as well as my shortlist of “must-have” family travel apps. The basis of any good location-based app is a map that shows you where you are and what is around you. There are several map APIs (or programming interfaces) available, but Google’s Map API is most widely used because it allows us app developers to build on top of the Google’s already extensive map data. Google’s Map API uses both address and latitude and longitude coordinates (latlong for short). For most purposes, address information is good enough to find locations, but latlong coordinates are even better for finding “hidden” places – like that playground in the middle of a park that can’t be found by street address alone. Lists are another aspect of any good map app. Lists are really helpful those who either know where they are going or just want to see what is around without looking at the map. A listing like this one from ikidnyis easy to read and helps you browse locations and review the distance or time it takes to get there. These features utilize your phone’s GPS capabilities and sometimes communicate with an external website to transfer the key pieces of data back and forth and compute the distance. 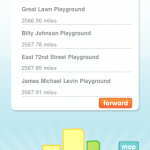 Most listings, like the one used by ikidny, will also provide a map option. Every good navigation app has its own voice and perspective designed to give you valuable insight about what to expect when you get to your destination. Apps like TripDoc feature content from key travel bloggers and uses icons to highlight specific categories like hotels, shopping, restaurants and activities. It also incorporates ways for you to interact with maps – and your friends – by letting you make notes and email your recommendations to friends and family. 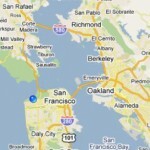 Apps like Sunday Drive allow you to interact with map data in other useful ways. Sunday Drive helps you find several places that are in the same general area and access driving directions or route information. Knowing where the nearest coffee shop, park or playground nearby a big attraction always makes an excursion go a lot smoother! Improvements in smartphone and video technology are also enabling more and more map apps to allow you to view video within an app. Noteworthy examples are Milwaukee Loves Kids and Madison Loves Kids by Julie Henning. By providing a video along with maps, and detailed text descriptions, these apps paint a much more vivid picture of each place than is possible through photos and text alone. My app, Mom Maps, takes advantage of these kinds of interactive features to personalize your mapping experience and adds another layer of context with reviews and ratings from a diverse community of parents and family travel experts like Travel Mamasand Family Travel Forum. It’s like getting the inside scoop from a friend in the know on what’s worth your time and what makes the cut when it comes to family and kid-friendly… and, of course, you can return the favor by adding your own opinions to the mix. Another example of the state-of-the-art in map apps is the hugely popular SitOrSquat. Like its name suggests, it provides critical information when you need it most – finding the closest bathroom wherever you are. SitOrSquat includes pictures, text, ratings and reviews, panning, great search capability, favorites, news, tutorials for using the app, and more. This sophisticated set of features sits on top a complex system of server scripts, requiring a seemless link between the app and back-end server necessitating all sorts of data flow and manipulation including actual position, desired position, search dependencies, panning and scrolling, and an interactive user interface. What’s next? Map apps will continue to push the boundaries of what’s possible in search, user interaction and social engagement. Not only will they lead you to great places, they will lead you to great products and deals near you and create new ways for you to connect with family and friends in location-based ways. There is so much innovation happening in this space right now, it’s truly an exciting time to be a developer! 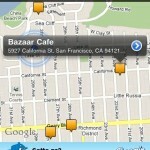 Mom Maps: Feel like a local everywhere. 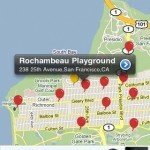 Finds kid-friendly parks, playgrounds, restaurants, and indoor play areas around you. 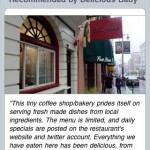 Includes ratings and reviews, robust search capability, and allows you to share your favorites via email or facebook. Available on iphone with plans to roll out Android soon! ikidNY: A favorite of locals and NYC visitors alike, this essential tool will change your life in the city as you know it. Imagine being able to find the closest parks, playgrounds, changing tables, indoor playspaces, museums, libraries, subway stations with elevators, kid-friendly restaurants, and more, all with the touch of a button. 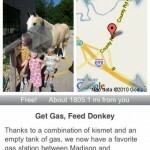 Kid Friendly Milwaukee/ Madison Loves Kids: A friendly, affordable place to live and play, the Madison Loves Kids and Milwaukee Loves Kids iPhone apps offer options for family friendly fun in Wisconsin’s two largest cities. With urban, rural, and seasonal suggestions from tots to teens, the apps are written by cheesehead Julie Henning. Sunday Drive: Sunday Drive takes mapping to a new level by mapping out routes that connect a bunch of interesting locations. Making out great drives – for a Sunday or any other day – it does this by connecting points of interest and providing driving directions. TripDoc: TripDoc create one map on your phone that shows everything you want to do with your kids on your holiday vacation – from playgrounds, to restaurants and activities. Get walking or driving directions from wherever you are to where you want to go next. Keep notes about each place, including confirmation numbers, recommendations, what you loved and more, and then share it all with your friends via email. SitOrSquat: Just say no to accidents! Sitorsquat is an app that is dedicated to telling you where the closest place to relieve yourself is and whether or not that place is worth even sitting or squatting (or standing) at. We all find ourselves needing a public restroom every once in a while, whether it’s walking down a city block or driving on a highway with a few whining kids in the backseat.